Dr. Waheed, a native of Maldives, graduated first in his class in medical school. He then came to the University of Illinois/Michael Reese Hospital in Chicago, IL for his Internal Medicine Internship and Residency. Dr. Waheed received the honor of being named “Chief Medical Resident” spending an additional year at Michael Reese supervising 70 Internal Medicine residents. Following this, he was named Associate Program Director of the Internal Medicine Program, a faculty position. Dr. Waheed completed his Nephrology Fellowship at the University of Miami, where he was honored to be named Chief Fellow during his time there. Dr. Waheed has had several articles published in peer-reviewed journals including an article on lupus nephritis (a special interest for him) in CJASN (8/12). Dr. Waheed considers mineral and bone disorders and acute kidney injury as areas of special interest as well. He and his wife, Dr.Lanie Braun (an internist) have a young son. 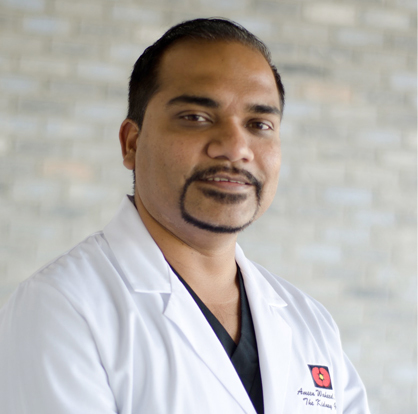 Dr. Waheed enjoys painting in his spare time and traveling with his family.